Greetings again from the darkness. The 1947 Partition of India is personally important and influential to director Gurinder Chadha (BEND IT LIKE BECKHAM), though we don’t understand exactly how until the closing credits roll. Until that point, we find ourselves questioning why Ms. Chadha and her co-writers Paul Mayeda Berges (her husband) and Moira Buffini attempt such an obvious crowd-pleasing structure for this historical saga. Perhaps the strategy was to educate as many as possible on the events from 70 years ago. An opening quote tells us “History is written by the victors.” Is this true? If so, who are the victors in this story? The British Empire ruled India for three centuries and their last Viceroy, Lord Mountbatten (great-grandson of Queen Victoria), was charged with structuring a peaceful transition to independence. The near impossibility of this challenge should have been readily apparent given the deep divisions created by religious and cultural differences, plus the immense friction between Hindus, Sikhs and Muslims. “Giving a nation back to its people” is not so simple when dealing with 20% of the world’s population. Hugh Bonneville and Gillian Anderson play Lord Louis and Lady Edwina Mountbatten, respectively. Despite managing what history has proven to be a disastrous decision, he is treated quite kindly by the filmmakers. Seemingly with his heart in the right place, Lord Mountbatten is presented as a pawn for the real power broker in England. His wife, on the other hand, is quite progressive and appears sincere in her efforts to better understand the Indian citizenry. In fact, as the most intriguing figure in the film, more focus on Edwina would have been welcome. Michael Gambon plays General Hastings Ismay, while Tanveer Ghani is Jawaharlal Nehru (India’s first Prime Minister) and Denzil Smith plays Muhammed Ali Jinnah (Pakistan’s leader). These are the key players in negotiations, while inexplicably, the filmmakers choose to veer from history and offer up the worst kind of cinematic melodrama: star-crossed lovers in the vein of Romeo and Juliet. As a metaphor for the Partition, the two lovers being torn apart by forces beyond their control is quite simply an unnecessary distraction. 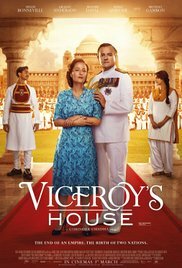 Mani Dayal (so good in THE HUNDRED FOOT JOURNEY) plays Jeet, a Hindu servant (one of 500) at the Viceroy House, while Huma Qureshi plays Aalia, the beautiful Muslim daughter of Ali (the late great Om Puri). Furtive glances are about as close as the two come to an actual relationship, but the film spends an inordinate amount of time on their wishes to be together. There are too many cringe-inducing moments for the film to be considered a serious historical epic. Gandhi gets some screen time and is absurdly described as “The British Empire brought to its knees by a man in a loincloth”. Other moments seem all too relevant today. The promise that “Muslims will not be treated as second class citizens” could easily be heard on a current newscast. The decision to split Pakistan and India seems motivated by Britain’s design on oil and geographic protection from Russia … both contemporary motivations for many decisions these days. The closing credits highlight the effects of the Partition: 14 million people migrated with approximately one million dead. We also get actual newsreel footage of the key figures from the story, as well as the documented reasoning of why this was so personal for director Chadha … perhaps too personal. This entry was posted on Thursday, August 31st, 2017 at 8:56 pm and is filed under Drama, World Cinema/Foreign. You can follow any responses to this entry through the RSS 2.0 feed. You can leave a response, or trackback from your own site.